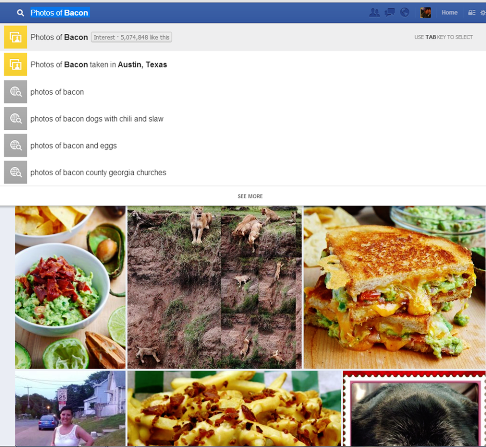 Facebook recently announced Graph Search. In this article I’ll share what Facebook’s Graph Search is, how it works and how it fits your marketing strategy. Graph Search is Facebook’s latest revision to the search feature that helps users find connections to people and places that have always existed in the graph. In a sense, it’s a clean interface into the breadth of Facebook data that people have entered into Facebook, but contextualized to each user. 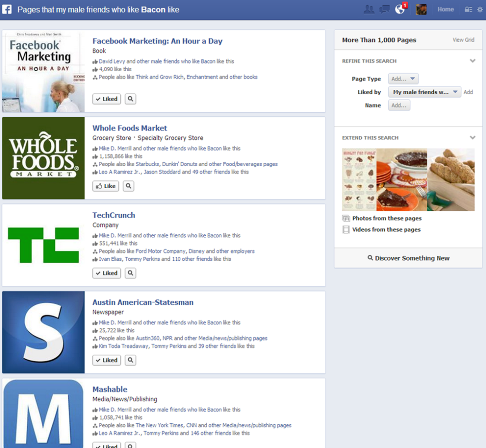 Watch this video introducing Facebook Graph Search. Think about that for a moment. Facebook’s new Graph Search serves up personalized search results in real time based on a person’s graph, and it does this for over 1 billion people. Kudos to the Facebook engineering team for this major achievement. As you’ll see below, it’s early for Graph Search. The features and use cases haven’t been fully fleshed out. And Graph Search is still in a very limited beta program. But this first version gives us clues about how Facebook may evolve and the strengths on which they’ll try to build. Let’s start with a search about one of my favorite foods—bacon! 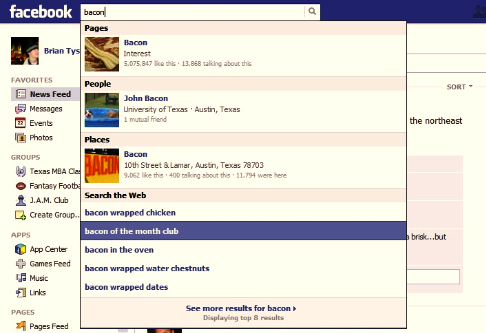 A search query for “bacon” in the existing, original Facebook Search format. This is helpful if you’re looking for something that includes “bacon” in the title of the Page, a person/profile or a place. But it doesn’t give you any insight into all of the other places on Facebook where there may be relevant social context to bacon. Who likes it? Who has commented on it? What else can the social graph tell us about friends and bacon? The original Facebook search does nothing for you if you want to know these things. This is dumb search, in essence, not unlike what we experienced with the first search engines in the late 1990s. Now let’s walk through a Graph Search for bacon. Here’s what you see when you use a semantic search for “bacon” on Facebook. Note that I’m provided with suggestions related to the search term I’ve entered. You can get to the Facebook Page for bacon, the Interest, the People who like bacon, My Friends who like bacon, photos of bacon, web searches of bacon and bacon wrapped water chestnuts. To navigate to one of the semantic search options, you can use the tab key to go a level deeper to find the people or Pages that you want. This is really Facebook’s first foray into what is known as semantic search. Put simply, semantic search is a concept referring to technologies that make a search respond to what the user enters to try to better understand what the user wants to know. Think of it as interaction between the search technology and the user to provide better search results. Search engines have done this for several years now when they fill out your search box for you and provide suggested keywords. It’s employing technology to get you closer to your answer without your direct intervention. Semantic search is a relatively new technology, so you have to accept this as an ongoing evolution and not a revolution. Semantic search is getting better every day, but has a long way to go to be precise based on your interests and behaviors. Here’s a look at the bacon Interest Page to see if there are any changes. Sure enough, there are. You get additional information on the interest provided by Wikipedia. OK, that’s useful. Screenshot of the bacon Interest Page. Additionally, you can immediately see who among my friends likes bacon, as well as photos that are captioned with the word bacon. This was discoverable before, but not nearly as easily. Overall, the Interest Page layout is different and improved in order to make social context clearer to the user. You may notice as well that at the top of the screen, the URL carries a ?sid=0.002… code. The implication here is that Facebook is tracking how people use Graph Search in order to improve the product. Note the code at the end of the URL for this search. 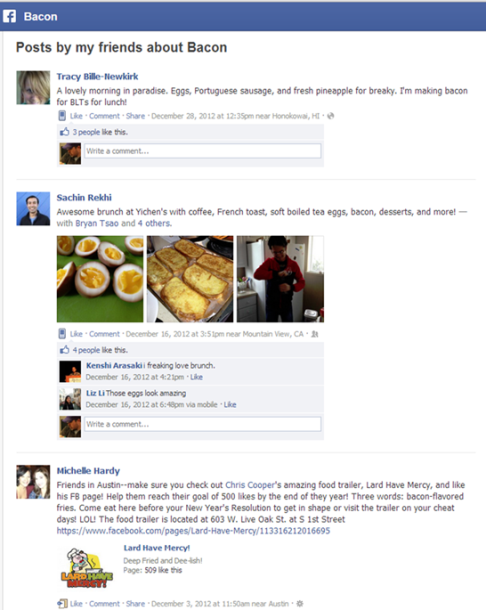 Additionally, the Interest Page includes posts by friends about bacon and Related Pages, which are in the screenshot below. It’s interesting that these posts are not individually mined by Facebook and made searchable, although I suspect that’s a forthcoming feature for Facebook’s Graph Search. Finally, wistful posts from my friends about bacon. People just love bacon. In the screenshot below, you’ll see a long list of my surely cholesterol-challenged Friends who like bacon. 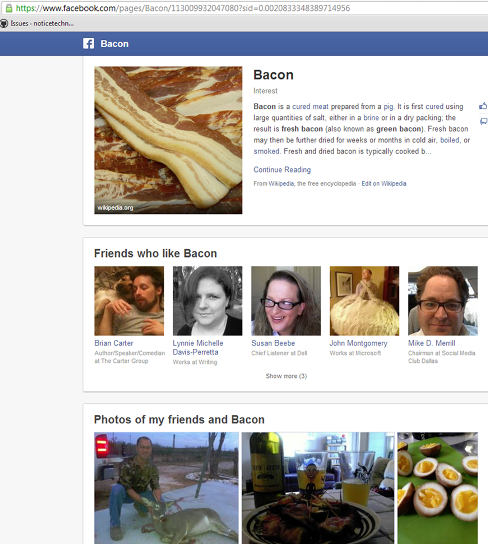 My friends who like bacon, provided by Facebook’s Graph Search. You’ll see a long list with the ability to refine your search on the right side of the screen. This appears to be sorted by the number of friends and subscribers for these items. At the top of the list is Brian Carter, a fellow author and speaker. Interesting that I don’t interact with him all that much, but he’s at the top of my list. I’d have expected this to be sorted by the number of interactions we’ve had rather than social reach. But that’s something Facebook can tweak later. Curiosity kills me, so I decide to take a gander at that one. Not a lot of surprises here. As you can see, I have supportive friends who like my book, Austin, eating healthy and technology. Yep. Sounds about right. This is a handy tool to identify Pages you should like. 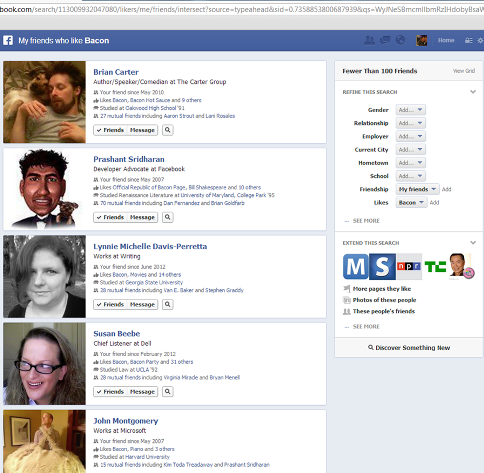 Interestingly, these are not sorted by the number of Page likes, but rather the number of friends who like each Page. Pages liked by my male friends who also like bacon. If I go back to the top of the screen and click the search box, I get another level of friends who enjoy bacon. 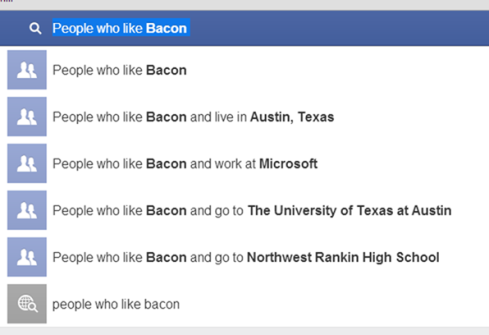 Now Facebook’s semantic search technology combines your groups and affiliations with your search term, in this case “bacon.” Presumably this is to give you the best opportunity to find people with intersecting interests and commonalities. Clever. I use the feature to find a friend or two in each category. I wouldn’t necessarily call this “intelligent,” but if it were hooked up to Siri on my iPhone, I’d be simultaneously amazed and creeped out by now. Next level of Facebook’s semantic Graph Search—suggesting I look at people from my groups and past affiliations who also like bacon. Facebook’s Graph Search providing another level of semantic context beyond Photos of Bacon. This is designed to get you closer to the search result you want. It reads from your profile to see your location. In this case I’m in Austin, TX and Graph Search tries to match your search term to something that is likely relevant to you. There are not a lot of options here for this semantic search of Photos of Bacon, but remember this is a new technology that will improve over time and will include more data as time goes on. Are you hungry for lunch and craving a hot dog? Let’s use Facebook to find something. A search for “hot dogs” yields disappointing local results. 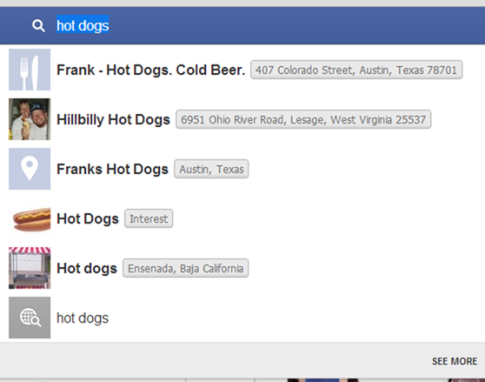 It’s curious why these particular search results for “hot dogs” come up, and none of the thousands of other places between Austin and Lesage, WV. 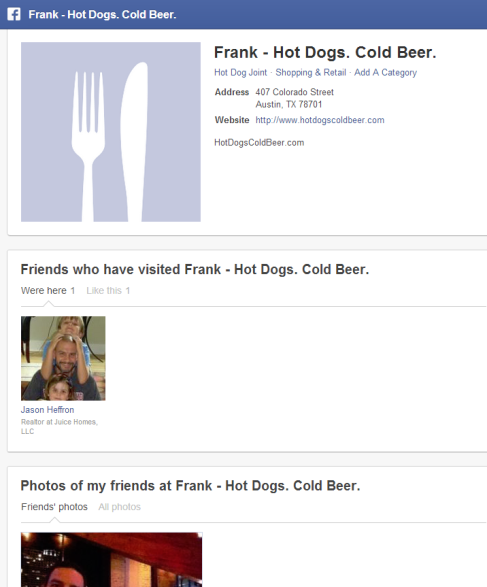 Do hot dog restaurants not market themselves on Facebook? Doubtful. And if you’re a marketer for a company selling hot dogs, how do you get on this list? Can you even break into Graph Search? I’m surprised that chains that sell hot dogs, such as Sonic or Dairy Queen, are not listed here while Hillbilly Hot Dogs is. This isn’t terribly impressive, but I’ll chalk this up to necessary cleanup for the Graph Search beta. Let’s investigate the only viable option for me here—Frank Hot Dogs. The first thing that jumps out is the redesigned Facebook Page that really looks more like a Yelp or Google local business listing. Address, website and map are all prominently displayed, as is the social context of my friend who likes Frank. Frank Hot Dogs in Austin, TX. Below the fold is also a listing of other local businesses near Frank, where you can presumably walk off your lunch. Notice in the image below that the listings in the “Places Near Frank” are sorted by the number of likes each local business has. 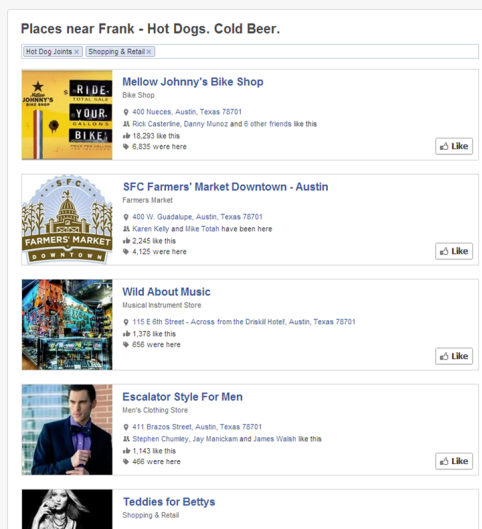 It’s interesting that social proof (in the form of a like) is used to build out your choices, even though Frank is in downtown Austin and is surrounded by other options. Places near Frank Hot Dogs. One final scenario here—let’s look at how Graph Search can help us find conversations on Facebook that would interest us. Apple has been in the news a lot lately with earnings announcements, popular products and conjecture about the company as a stock investment. 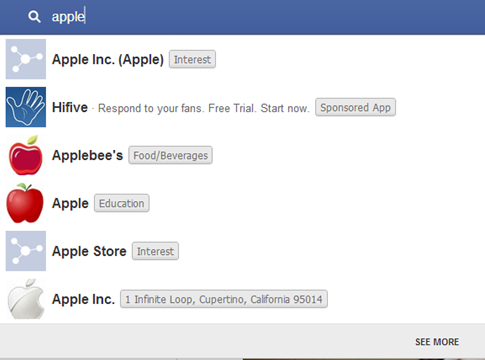 Here’s what Facebook has to offer for a search of “Apple”: an Interest, a Sponsored app (interesting), Applebee’s, Apple for Education (? ), the Apple Store and Apple as a Place. When you click Apple, Inc., you get a new set of semantic results. This is significantly better—as I have friends who work at Apple, I was expecting to see that. But it’s several levels down and requires you to go through several steps to find it. So usability is an issue, and in the efforts to create something “semantic,” Facebook might have made it somewhat difficult to navigate, at least today. 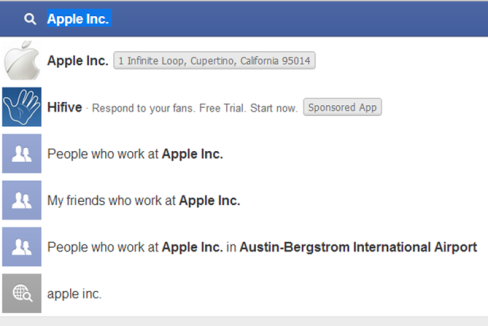 Also note that there is no mention of status updates or comments that people have made about Apple. I’d really like to see that in one place. You need to go through several steps before you find out what your friends are saying about Apple. Facebook Graph Search—What Do We Know? 1. It’s a better interface into a lot of data that we’ve been able to access for a while. Facebook is making it easier and is using it to help users discover commonalities with friends and discover places to visit. 2. In several places, results show that Page likes are a proxy for “wisdom of the crowd,” and are given preferential treatment over those not as fortunate. This is important for marketers—Facebook considers likes to be valuable social validation and a driver for recommendations. Contrast that to Yelp, where a large number of positive reviews are considered to be premium social capital. 3. It’s clear that Facebook regards Pages with more fans to be more important than those without. Watch for this trend to continue and for Facebook to make social search more data-driven. 4. Page likes are “link-building” in the context of Facebook. Today you have to optimize your content for feedback to show up in the news feed, but that could very well extend to mobile devices and social search on Facebook and possibly beyond. 5. Brand-building is going to be tougher in a few years than it is today. It will only get harder over time, so there’s a case to be made for action to be taken now to build an active and engaged audience on Facebook while it is relatively inexpensive and easy. 6. Status update and comment content is largely untapped as a data resource in this version of Graph Search. It’s a huge opportunity that will certainly make Graph Search a richer experience for users. 7. For businesses seeking leads and customers, Facebook is taking its first steps to capture and calculate how its local listings and discoverability features result in sales. Attributing Facebook actions to more leads, sales and profit is an important theme for Facebook moving forward. Graph Search can and will ultimately help with that. 8. Finally, any person who changes privacy settings to Private is going to be largely undiscoverable in Graph Search. That may not be a big deal today, but could become one as Graph Search becomes a richer and more important part of the Facebook experience. Facebook has taken the next step in evolving beyond social into social-driven search. Is it going to replace Google anytime soon? No, but that isn’t the question to ask today. Facebook is taking steps to make social relevant in the context of search—and that’s a long-term project. This first version is promising, but has a long way to go to meet its full potential. The takeaway for marketers is that the basics really haven’t changed significantly. You need to host a thriving and growing community on Facebook to take full advantage of how the industry evolves. You need more fans, more comments and more social engagement. That’s always been the case. But we haven’t known where the industry is heading necessarily. Graph Search is a window into the future, but a largely unrealized vision today that will take time to emerge. Think about how Facebook will improve the overall user experience using data in the Graph in the future. Slowly but surely, it’s becoming a bigger part of our lives. What do you think about this new feature? Leave your questions and comments in the box below. Chris Treadaway is Founder & CEO of Polygraph Media, a social data analytics company, and co-author of Facebook Marketing An Hour a Day with Mari Smith.